Blues music fans will be granted a brand new weekly show in January 2019, featuring the prolific Joe Bonamassa! Different Shades of Blue with Joe Bonamassa will begin airing on January 21st, 2019 at 6:00pm EST as a part of SiriusXM’s “B.B. King’s Bluesville” (CH 74). It is only fitting that the multi-Grammy-nominated blues guitarist, singer, and songwriter should have his very own weekly curated blues radio show on Bluesville, as B.B. King was the man who discovered Joe Bonamassa at just 12 years old. Joe has since gone on to both play with the living legends of the genre, and become one himself. Bonamassa plans to take blues music fans for a deep dive into his own personal genre history lesson, pulling favorites from the 1920s through the 1980s. A 60+ year sonic adventure from early founders to the titans we know and love today. Joe also plans to feature a very special segment dedicated to new emerging artists, entitled “Keeping the Blues Alive”. The segment is named after his charitable organization, which donates instruments and funds music scholarships for schools across the United States. Tune-in weekly to SiriusXM “B.B. King’s Bluesville” (CH 74) starting on January 21st, 2019 at 6:00pm EST to catch every audible second. 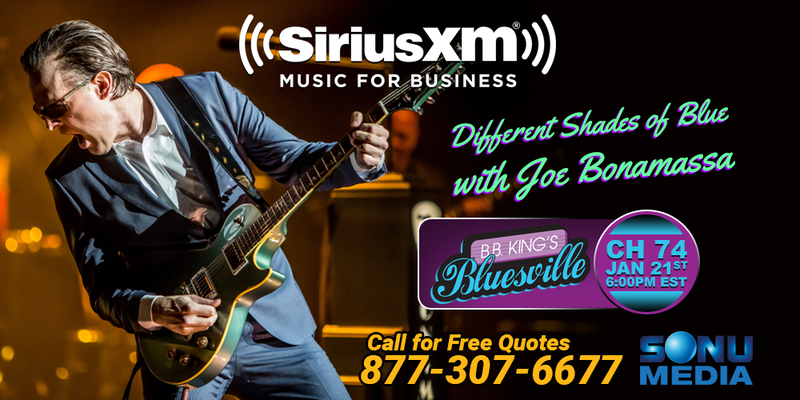 Different Shades of Blue with Joe Bonamassa is just one more reason to activate SiriusXM Music for Business. Contact Sonu Media for special offers on licensed music for your commercial property and business phone lines. Power your brand with the sound of SiriusXM!